Shoxy and Alexandar Ivkovic are regarded as two of Serbia’s best-kept secrets. For years they have been amongst the finest DJs on the Serbian circuit. 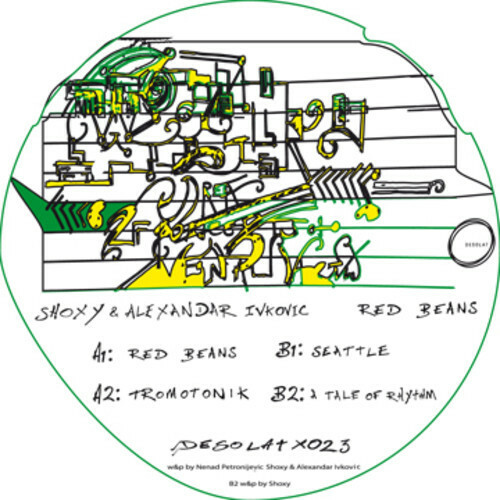 With a handful of releases under his belt on labels such as Davide Squillace’s MiniSketch Records, Shoxy has already caused stir on dancefloors worldwide, but this time he unites with Ivkovic for their debut EP, ‘Red Beans’. This 4-song EP is one hell of a hypnotic ride. Its movements are subtle, the dynamics slight. The deep production employs both classic and underground house signatures but rather than serving them up on a platter, the listener is teased while being led on a trance-inducing journey. Anyone looking for “massive drops” or pop hooks best look elsewhere. However, make no mistake – these deep grooves are made for the dancefloor. The opening, title track is a thick, bassy number characterised by its unmistakably Caribbean vibes. A repetitive female vocal sample and flute are paired against a fat and steady beat, then topped with rhythmic hand-percussion. Its melodies are minimal but – just like the EP as a whole – the constant bass-groove dominates the song and simultaneously provides the catchiest element. “Tromotonik” is another bass-heavy club-banger and gets straight down to business. The production on this one is unique in that it applies a layer of crowd noise giving the listener the experience of being inside a noisy club. Brilliant stuff. Recognizable by its repetitive, deep house-style organ stab and open-hat, four-on-the-floor beat, “Seattle”, along with final track, “A Tale of Rhythm”, are the least dynamic of the tracks, but they’re also the most hypnotic. An excellent display of minimalism, subtlety and consistency, the ‘Red Beans’ EP will be released 12″ coloured vinyl on 3 February, 2014 and digitally on 10 February, 2014. Listen to snippets of all 4 tracks from the EP below.